Louis Campanelli was born August 10, 1938 in Springfield. Smart, athletic and super-competitive, Lou wanted to play baseball but learned as a teenager he just couldn’t hit a curve. It was basketball that he ultimately fell in love with, even after being cut twice from us high school team. After attending Montclair State, Lou was offered a job in 1960 as an assistant coach at Hillside High. The head coach was Rollie Massimino. 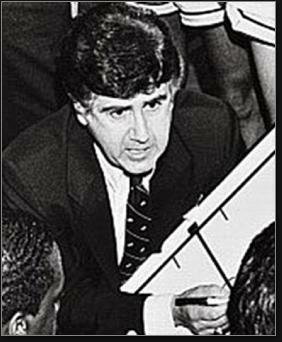 Lou worked his way up the basketball coaching food chain during the 1960s, earning a reputation as a fine teacher of fundamentals, a proponent of unselfish teamwork and a sly tactician. Stops included Levittown High in Long Island and assistant positions at D-II Bridgeport and D-I Rhode Island. Lou got his first college coaching job in 1972 with James Madison University, which had only created a men’s basketball program in 1969. In 1976, the Dukes achieved Division-I status. The Dukes went 53–25 in his first three D-I seasons, playing as an independent. The student section of the school’s 5,000-seat arena became known as The Electric Zoo. In 1979–80, JMU joined the Eastern Collegiate Athletic Conference South and won 18 games for the third season in a row. The following year, the Dukes went 21–9 and earned an NCAA Tournament bid. The Dukes scored a first-round upsets over Georgetown, and repeated this feat against Ohio State in 1982 and West Virginia in 1983. They also won the ECACS Tournament in 1983. 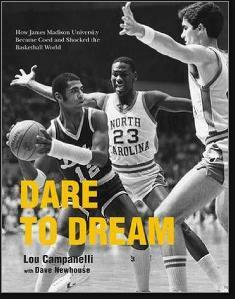 Lou’s best game as a coach may have come in a second-round loss in 1982 to Dean Smith’s Tar Heels. The JMU defense countered everything UNC could throw at it, including a freshman named Michael Jordan, who would go on to hit the winning bucket in the championship game. Against the Dukes, MJ managed a meager 6 points. UNC barely survived, 52–50. Lou spent nine years at JMU and never had a losing season. In 1985, he was hired to coach the University of California Golden Bears. He resurrected a sleepy program immediately, scoring the school’s first win over UCLA in 25 years and taking the Bears to the NIT. He not only challenged his players to succeed, but aimed his electric personality at the fans. More than once he turned around and yelled, “Cheer or go home…this isn’t an opera!” In 1990, Cal earned an NCAA bid for first time in three decades. In eight years at Berkeley, Lou coached some talented players, including Kevin Johnson, Leonard Taylor, Keith Smith, Roy Fisher, Brian Hendrick and Lamond Murray. In 1990, the Golden Bears went to the NCAA Tournament and upended Indiana in the first round before losing to powerhouse UConn. The win over Bobby Knight lengthened his resume of victories over college coaching icons. Lou stayed in basketball, finding work as a TV analyst, NBA scout for the Nets and Cavs and even coached in Japan. In 2000, he was hired by the PAC-10 as coordinator of officials. After retiring in 2006, Lou got involved with the Campolindo High in his hometown of Moraga CA,, taking a lower-profile position as a JV coach. In 2015, Lou suffered a stroke. A year later, he published his autobiography, Dare to Dream.